Although Hyperemesis Gravidarum (HG) affects less than 2-3% of pregnant women, it can cause a multitude of health problems and can even land you in the hospital. Kate Middleton suffered Hyperemesis Gravidarum during all 3 of her pregnancies, bringing a lot of attention and awareness to the condition. So, what is HG? How do you know if you have it? And what is the best hyperemesis gravidarum diet? In this article, we define hyperemesis and discuss the symptoms and what to expect. We also discuss the best hyperemesis diet. Morning sickness plagues women of all ages. Increased hormones and increased blood flow heightens your sense of taste and alters your sense of smell. Even your favorite foods are the most putrid thing you have ever smelled. Up to 90% of women experience morning sickness in their pregnancy (the other 10% are aliens and liars). However, there is a point where you can become too sick. Hyperemesis gravidarum (translated as “hyper vomiting") is a severe case of nausea and vomiting during pregnancy. This condition is temporary, but it can be physically draining. It can lead to serious health problems such as dehydration, tears in the esophagus, kidney problems, blood clots, low birth weight and even miscarriage. HG usually hits around week four to six of your pregnancy. HG can last until the twentieth week if not medically treated. There is no clear reason why some women suffer from HG or its actual causes. If you have ever had morning sickness, it is no secret that it is dreadful. You have no energy. Raw chicken is literally the most disgusting thing you could ever smell. You are in what seems like a constant state of nausea. Some days are better than others, but most days you get through the day successfully. Regular morning sickness may cause you to lose a pound or two, but nothing significant. You are able to at least keep down some crackers, ginger tea. and lemon heads. A typical bout of morning sickness happens when you wake up because the body has gone so long without eating. The hunger has made you nauseous. 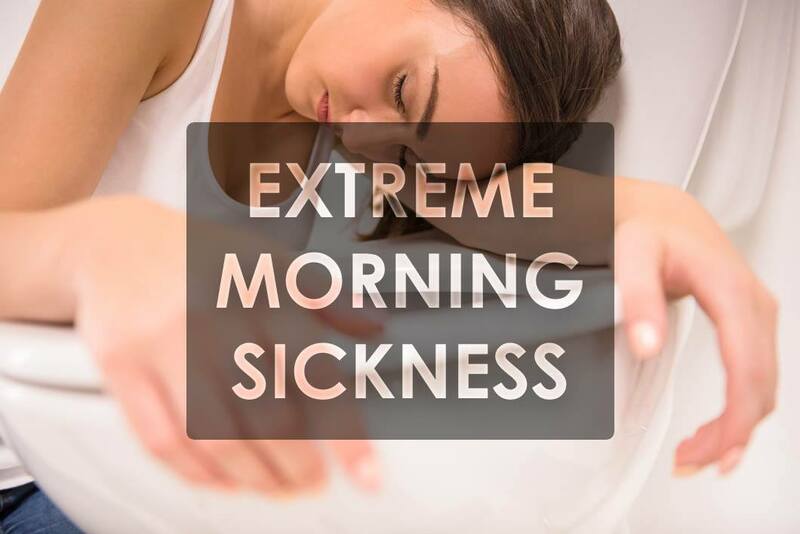 However, “morning sickness” can happen at any point in the day. Morning sickness usually starts winding down around the ten-week mark, but how long it lasts varies among women. A typical case of HG will leave you not only tired, but physically exhausted to the point where you don’t even feel like getting up (unless you have to vomit, again). You cannot keep anything down with HG, not even water or crackers. The dehydration and malnutrition causes dizzy spells and weakness-mainly because your blood pressure is so low. HG can cause you to lose up to 5% of your body weight and can only be subdued with some type of anti-nausea medication that is safe to use during pregnancy. More serious cases of HG can put you in the hospital for severe dehydration and malnutrition. You will need to be given liquids and nutrients through intravenous (IV) fluid, take anti-nausea medication, and have your platelet count monitored throughout your pregnancy. If you suspect you may have HG, call your OB-GYN right away. Arrange to be seen as soon as possible. During a typical test to determine whether you have HG, the doctor will ask about your medical history and symptoms and will look for common signs of HG. A blood and urine sample will be taken in order to look at platelet count, electrolyte levels, and urine ketones. If needed, the doctor will more than likely send you to the hospital if your urine shows signs of severe dehydration. Some cases of HG can be lessened by changing your diet and stress levels. For example, try eating smaller meals throughout the day, drinking electrolyte-replacement drinks, and practicing stress management. In essence, it's important to eat two or three small meals a day and small snacks in between. Also, women are encouraged to eat before getting out of the bed and right before getting into bed. Here's why: it helps to curb that early morning sickness you feel from staying hungry for too long. Some vitamin studies have linked a vitamin B6 deficiency to severe nausea and morning sickness. Make sure your multivitamin (prenatal vitamin) contains vitamin B6 in order to get your daily dosage. Do not take single dose vitamin B6 supplements if you are experiencing HG. Taking high levels of a certain vitamin in one dose during pregnancy has been proven to be unsafe. If you have noticed that there is blood in vomiting during pregnancy, go to the hospital immediately. Blood in your vomit can indicate a tear in your esophagus or your stomach lining. It's critical that you get medical attention as soon as possible. You will also need to go to the hospital if you have gone two days without being able to keep any fluids or food down. Dehydration during pregnancy can become very serious, so don't hesitate to get help. Your baby is counting on you! While at the hospital, you will be given IV nutrition and anti-nausea medication by injection. During your stay in the hospital, they will take multiple blood samples in order to keep an eye on your blood count. In some cases they will also take sonograms of your heart and legs as well as an MRI if they suspect that you have developed blood clots due to bed confinement. So now that you know what HG is and its symptoms, hopefully you have realized that you just have regular morning sickness. If not, as mentioned before, let your doctor know and schedule an appointment as quickly as possible.